I wish every month was Oscar season. Here are some celebrity pics. Jennifer Aniston looked stunning when she presented with Jack Black. She carried herself well, knowing ex-hubby and hubby-stealer would be staring at her the whole time. 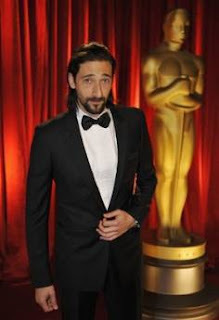 ...the dashing Adrien Brody, who presented for Best Actor. Jessica Biel, who presented some technical achievement award. ...Sarah Jessica Parker, who presented the award for Best Art Direction, Costume Design, and Makeup. That girl behind Ms. Parker is the cute geeky girl who sat beside the guy that Jessica Biel gave that technical achievement-thingy to. Slumdog Millionaire's Freida Pinto in a stunning blue dress, who presented with Liam Neeson for Best Foreign Language Film. 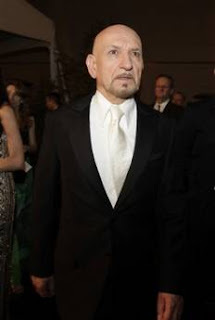 ...Joel Grey, presented Best Supporting Actor. I included Mr. Grey for those who, like me, don't know how he looks like. The beautiful Marion Cotillard (I love the eyeliner! ), presented Best Actress. The always-beautiful Natalie Portman in this sweet raspberry gown, who presented Best Cinematography with the outrageous Ben Stiller. Premiere Hollywood pothead Seth Rogen, who together with James Franco and Janusz Kaminski, presented the award for Best Live Action Short. 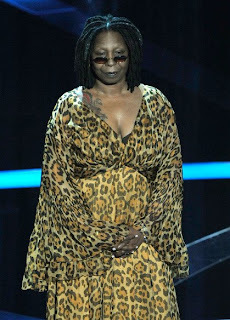 Whoopi Goldberg, in a dress straight out of the Serengeti. It would've been better if she came in her Sister Act costume. *photos from www.tvguide.com, gofugyourself.celebuzz.com, and the Associated Press. "the dashing adrien brody"?? seriously. =| he just looks so...old.